Have some Ming Dinasty bowls and vases that you want ot get rid of? Why not build a gigantic fountain in the middle of your house with it? That's what one family did in the 18th century. The Casa del Risco, or House of the Cliff, is located in San Jacinto Plaza in San Angel, right where the Bazaar del Sabado takes place. 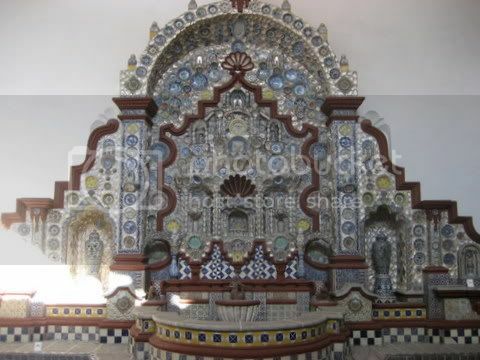 The Casa, now a museum, is free to enter, and contains 14th - 18th century paintings and other temporary exhibitions, but the main attraction is the large, two-tierd fountain built out of priceless ceramics and tiles.